I am devastated to share the following news with you, and must warn you of the graphic nature of the photographs associated with this article. On the heels of two known orangutan murders this year in our province of Central Indonesian Borneo, there is further disturbing news. Orangutan Foundation International (OFI) field staff have just reported that a translocated cheekpadded adult male orangutan was found dead at a palm oil plantation on the eastern side of Tanjung Puting National Park. A microchip implant identified the orangutan as Baen, a male approximately 20 years of age who had been translocated by OFI from that very same palm oil plantation on September 23, 2014. Over the years OFI has translocated many orangutans found close to or in palm oil plantations. Once notified that a wild orangutan is in a difficult situation, OFI staff respond immediately by tranquillizing the orangutan and safely relocating him/her away from the danger zone. When orangutans are moved from one area to another, their excellent memories often guide them back to the “home” area from which they were taken. Unfortunately, plantation owners and workers often see these orangutans as pests, agricultural vermin that need to be expunged. 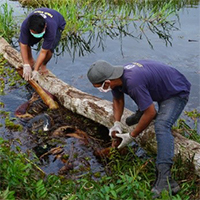 Baen’s decomposed corpse was noticed in a plantation canal in the Seruyan district when workers were clearing forest to expand the plantation. OFI rangers along with officials from Conservation of Natural Resources and Ecosystems (KSDAE) were called in to investigate. OFI veterinarians were on the scene to examine the body. Dr. Ketut, one of OFI’s veterinarians said, “Baen’s death was from an act of violence”. 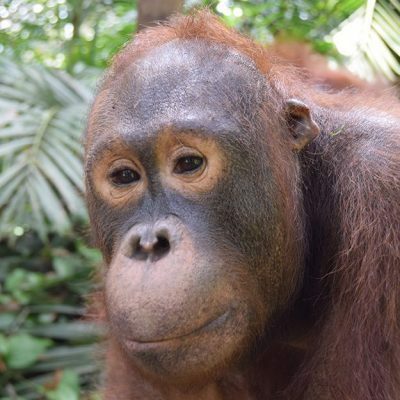 Baen’s corpse was brought to the Orangutan Care Center and Quarantine (OCCQ) in Pasir Panjang where he was further examined by OFI veterinarians and government investigators. It is estimated that Baen was killed one or two weeks before being discovered. His corpse was riddled with seven airgun pellets. “He probably had run-ins with people before; not all seven pellets are from the same time,” Dr. Ketut explained. “It was the pellet that entered his stomach, causing internal bleeding, which debilitated him. He was too weak to climb away from the people who came at him.” Alongside a severed finger and fractured arm Baen had deep wounds on the back of his shoulder, likely from a machete. Baen’s corpse was found in PT Wana Sawit Subur Lestari II (WSSL II)’s plantation, a subsidiary of major palm oil producer Best Agro Plantation. This brings the known number of orangutans found dead in this palm oil plantation to five.News of Baen’s death comes on the heels of two separate reports, from January and February of this year 2018, of two adult male orangutans found dead in other palm oil plantations in the province of Central Kalimantan. Both were slain brutally at the hands of humans. Education is a key component in OFI’s conservation programs for orangutans and their tropical rainforest habitat. In the past, OFI has voluntarily worked with PT Best to educate and train its staff on how to manage orangutans inside the plantation without conflict. OFI continues to raise awareness of the orangutans’ plight nationally and internationally, as well as protecting tropical rainforest in the field.OFI’s “Protection and Patrol Program” includes teams scouring the forest, building guard posts, and securing support from local communities to safeguard threatened species, such as orangutans, and forest. OFI will redouble its efforts to protect and translocate orangutans in dangerous situations to safety. OFI’s resolve is stronger than ever to conserve, and rescue orangutans, as well as reduce orangutan-human conflict. 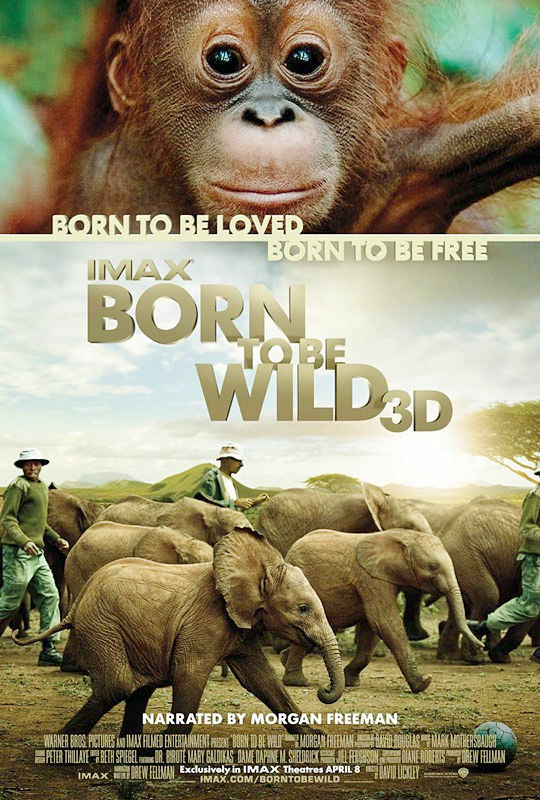 The siege on wild orangutans is real and it is happening now. 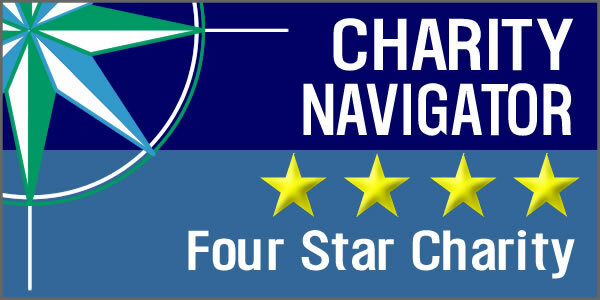 We need your help to upgrade our network of guard posts and increase the number of patrols. Would it cost too much to put a tracker on relocated Orangutans so that their whereabouts can be monitored, thus perhaps preventing a tragedy like befell Baen? As sad as this story is, I think it is important that people know what OFI is handling. It is not just soothing infants and taking toddlers to the nursery forest and releasing OFI’s successfully raised older orangutans. There is loss and death and a race to save enough rainforest habitat so that the gentle orangutans do not become extinct. 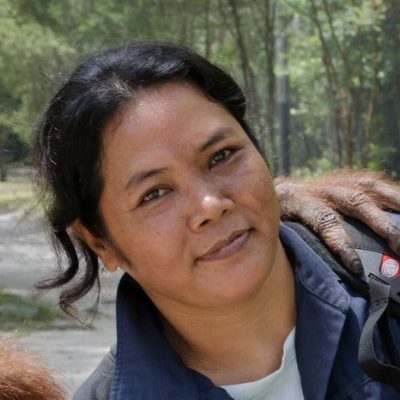 Hi Lorill, You may have already received an official reply from OFI, but I do know from Dr. Galdikas’s speaking engagements in Texas the first week of April 2018 that there are tracking devices on some orangutans. Everything takes money, but no one is more dedicated to the animals than Dr. Galdikas and her employees.